At least 110 people were arrested, while 196 others were detained over the past 24 hours, according to Turkish news agencies. Police carried out the operations in at least 35 provinces across Turkey. 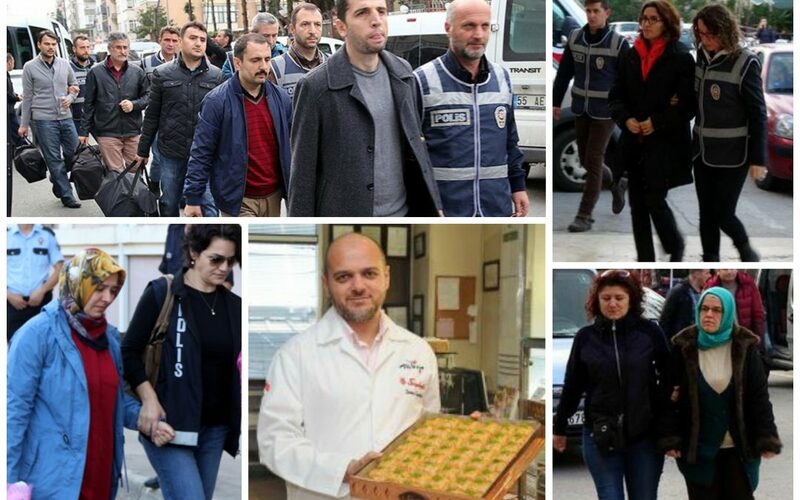 With most of the arrestees being academic personnel, those arrested over the past day also included civil servants, police officers, courthouse personnel, hospital workers, engineers and the owner of a baklava chain. Among those detained are teachers, civil servants, businessmen, police officers and military pilots. Meanwhile, Turkey’s Interior Ministry on Friday dismissed a total of 265 military officers, 153 from the Gendarmerie Forces Command and 112 from Coast Guard Command, on the grounds that they have links with the Gülen movement. Defense Ministry also announced on Friday that a total of 195 personnel, 158 of whom are officers, have been dismissed from the Land Forces Command and Naval Forces Command over the same accusation. In Malatya province, 4 civil servants were suspended along with a doctor on Friday. The victims of Friday’s operations carried out as part of the massive purge have been added to the already-huge group of people who have been either detained or arrested since July 15. More than 105,000 people have been purged from state bodies, nearly 72,000 detained and some 34,000 arrested since the coup attempt. Arrestees included journalists, judges, prosecutors, police and military officers, academics, governors and even a comedian. Critics argue that lists of Gülen sympathizers were arranged prior to the coup attempt.